The barometer was plummeting and the heavy sea mist had rolled up out of the south west quickly blotting out the sun and casting the world in a uniform steel gray light . Huge southern rollers swept up in relentless rows out of the south west. Here at 56 degrees south, the southern ocean literally belts around the bottom of the globe and aside from a few tiny sub Antarctic islands like South Georgia, there is no land mass to block the path of these massive waves. The huge southern ocean bommers gather momentum and power then explode with terrible force against South Georgia’s rocky cold shores. “Not many people come on my trips”, The Leader observed dryly as our small group kitted up on the beach. I shuffled my feet in the Bundeena sand, a little nervous. ‘What exactly does that mean?’ a small, slightly shrill voice in my head said. Do others in the club know something I don’t? Or do people go out with The Leader and not return! Bob and Kevin laughed lightly at the comment as they adorned themselves with the gaudy accoutrements of the sea-kayaker. Partially assured by their mirth I continued to load my boat, contemplating what may lie ahead. We set off in Johns’ car, he had both kinds of music, Country and Western. Luckily I was aware of this likelihood and brought my own. The map provided to find the Ferry Terminal in Sydney was completely wrong so we drove around a bit, saying “We want to be over there I think.” Stumbled into the terminal eventually, many of the Targa Tasmania cars waiting to go over also. Lots of posturing and preening evident, and from the rally competitors as well. Set off a bit late, but as we were sitting on the back deck in 30 degree heat sucking back Cascade we accepted this with alacrity. We discovered that our ship, “Spirit of Tasmania III”, was actually bought second hand from Greece, apparently no longer being sufficiently seaworthy to bimble around the Greek Islands. This was of no concern to us who had more pressing matters to attend to, namely getting another round and ogling the (female) purser. The First Officer addressed us over the tannoy to tell us a mild crossing with 4 metre swell was predicted. After a pleasant dinner and 10 or so beers we retired to our bunks. On the first day of this epic 350km crossing we were inches away from being swallowed by two container ships. After playing chicken with these moving steel islands, we were greeted by a 6-8m breaking swell on the second day. Naively, we thought that it couldn’t get any more exciting. How hideously wrong can one be? On our sixth day, we were cunningly hunted by a pack of tiger sharks as we approached Flinders Island. Our Bass Strait Crossing provided its fair share of harrowing moments as is expected in this notoriously violent stretch of ocean. Um…..No. Sorry to disappoint, but this is a story of two young mates, a Pittarak double kayak and our team mascot Mr Penguin who successfully crossed Bass Strait via the “Eastern route”. Surprisingly, there are 28 islands between the Australian mainland and Tasmania. 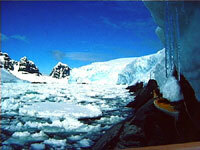 Our course linked 4 of these islands, with the largest distance between two of them being 72km. This route is crowded by at least 3 parties of kayakers each summer. 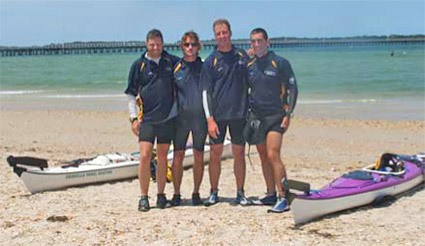 Four friends, Jonathan Papalia, Judd Boeker, Anthony Buykx and David Southwell had talked about kayaking across Bass Strait for a long time. The plan began formulating almost immediately after three of them had completed a kayak journey from Cape York, Australia across to Papua New Guinea, five years earlier. All are experienced kayakers with many years of marathon kayak racing and ocean kayaking between them. But Bass Strait was to be the biggest challenge. 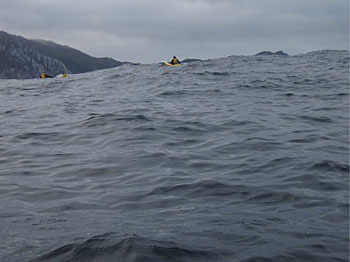 The goal was to kayak four individual Pittarak kayaks without sails from mainland Australia to mainland Tasmania via the eastern route connecting distant islands before passing down the west coast of Flinders Island. With weather reports received during the drive to the southern coast of Victoria indicating strong north-easterly winds the planned start at Tidal River for a kayak around Wilsons Promontory to Refuge Cove was switched to a longer kayak from Port Welshpool (on the other side of Wilson Promontory) to Five Mile Beach then onto Refuge Bay which would be sheltered from the strong north-easterly wind. The Sydney to Hobart Kayak Trip by Simeon Michaels. Reaching out for a better future. In the Summer of 2007, I paddled from Sydney to Hobart. The 2000km, 2½ month trip was dedicated to raising awareness about a pulp mill proposed for the Tamar Valley in Northern Tasmania. If it proceeds, the mill will consume 5 million tonnes of forest every year, pollute the air, and pump billions litres of dioxin-laden effluent into the crystal waters of the Bass Strait – not something a kayaker (or anyone else for that matter) wants to see. My trip also raised money to advocate for sustainable alternatives to the proposed mill– the future that Tasmania deserves. The trip website http://www.paddlewithsim.com/ records the adventure, with stories about sharks, storms, crossing the Bass Strait and coping with the challenges that inevitably arise on a trip of that length. The site also allows you to sign the petition against Gunns proposed pulp mill. Check it out.